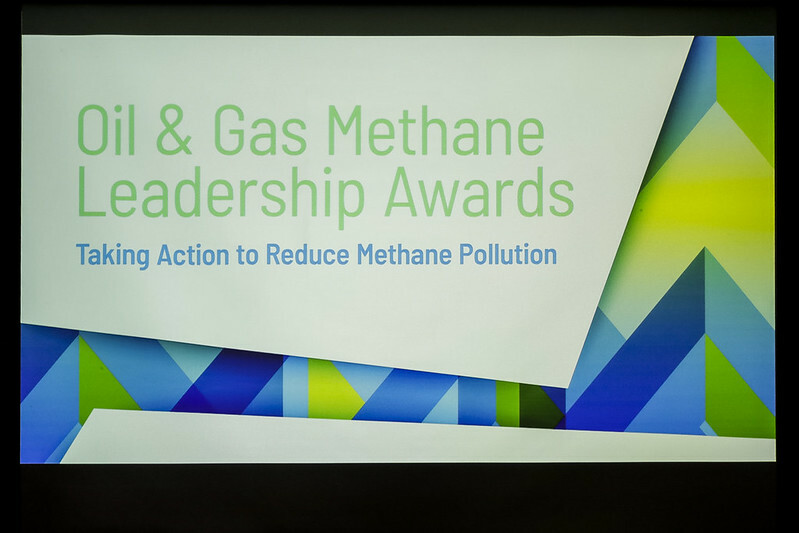 TORONTO — The inaugural Oil and Gas Methane Leadership Awards were awarded to leading government jurisdictions and other entities in recognition of actions taken to reduce harmful methane emissions from the oil and gas sector. At a ceremony coinciding with the Global Methane Forum, the Center for Clean Air Policy, Clean Air Task Force, Environmental Defence Canada, Environmental Defense Fund and the Pembina Institute recognized four leaders in methane reduction. The states of California and Colorado received awards for Leadership by a Subnational Government. Colorado was recognized for developing leading methane emissions reductions through a collaborative process with industry and environmental groups, an approach that was later copied by other states including California. In 2017 California expanded their effective methane regulations to gas distribution and storage facilities — a first of its kind. They are now looking at ways to reduce methane from agriculture and landfills. Subnational governments such as Colorado and California play a critical role in reducing methane emissions, either by filling gaps in federal regulations or by implementing policies designed to address regional specific issues while still meeting federal environmental outcomes. Mexico, while still developing their regulations, was recognized as an Emerging Leader for its commitment to reducing methane emissions by 40-45 per cent and the consequent work in developing a sector-wide regulation covering methane emissions across the supply chain. The Emerging Leader award is designed to acknowledge a country that is in the process of establishing methane regulations and has set goals and timelines for their process. It is about encouraging countries and recognizing the effort needed to issue strong regulations and Mexico has shown exemplary leadership in this regard. In the category of Technology Innovation, the imaging company FLIR was selected for its innovative sensing solutions including cost effective hand held cameras that can be used by industry to identify and stop fugitive emissions, thereby protecting the environment and saving money. Researchers, governments, and ENGOs have used this technology to identify the source and magnitude of emissions and inform policy development. In 2013, Mexico amended its constitution to grant private and international companies access to its energy resources. As part of these reforms, Mexico launched the Agency for Safety, Energy and Environment (ASEA) to regulate both the existing oil and gas sector and any new entrants. Since that time, Mexico has taken a very aggressive role in trying to reduce pollution from the oil and gas sector and they are one of only a few countries to include methane emissions from the oil and gas sector in their commitments to the global climate accords and the only country to include black carbon. In 2016, Mexico, the U.S., and Canada, as part of the North American Leaders Summit, committed to reducing their methane pollution from the oil and gas sector by 40-45 per cent by 2025. Since then, the environment ministry (SEMARNAT), the energy ministry (SENER), ASEA, and a number of other agencies have been engaged in an effort to develop policies to achieve this goal. ASEA is in the process of drafting regulations for new and existing sources in the oil and gas sector and has set a goal of final regulations by the end of 2018. In addition, a yearlong inter-institutional initiative led by SEMARNAT and SENER has led the drafting of a national policy for methane mitigation from the oil and gas sector. Once this national policy and regulations are finalized, Mexico will join a small group of nations that are leading the world making efforts to improve quantification of emissions through onsite measurements, share data across energy-environment regulators, implement best regulatory practices, promote emerging technologies, evaluate fiscal incentives and explore green financing opportunities in order to reduce methane emissions from the oil and gas sector. Accepting on behalf of Mexico: Rodolfo Lacy, Deputy Secretary of Planning and Environmental Policy at Mexico’s Ministry of Environment and Natural Resources (SEMARNAT). Mr. Lacy holds a PhD in Science and Environmental Engineering from the Metropolitan Autonomous University in Mexico (UAM) and a M.S. in Environmental Planning from Massachusetts Institute of Technology (MIT). He coordinated and edited the first State of the Environment report in Mexico and is author of the book “Air Quality in the Valley of Mexico”. In 1994 he was awarded a Rockefeller Foundation fellowship in the program Leadership for the Environment and Sustainable Development -LEAD. He is the founding President of the Environmental Engineers Association of Mexico, former Head of Advisors to the Minister of SEMARNAT, Research Coordinator for Energy and Environmental Projects at the Mario Molina Center, and General Director for Prevention and Control of Environmental Pollution at the Mexico City Government, among other positions in the public sector. Colorado has been a pioneer in reducing methane emissions from oil and gas for more than 10 years, starting with early regulations in Denver-Front Range that serves as the model for the US EPA’s 2012 standards for new wells and compressor stations nationwide. In 2014, working with industry and environmental groups, Colorado was the first state to develop and implement regulations directly addressing methane emissions, including the first rule requiring leak detection and repair from new and existing sites, statewide. Again, this served as a model for the package of standards that US EPA and the US Dept. of Interior put forth for new sites and certain existing sites in 2016. These standards have served as powerful examples for other jurisdictions — demonstrating that not only can regulations requiring these technologies reduce methane emissions, but also that they are highly feasible and cost-effective. Under the series of standards issued by Colorado, operators have adopted a range of technologies to reduce emissions. Colorado is continuing to move forward. Last fall, Colorado strengthened leak detection and other standards in the Denver-Front Range area, and currently, the state is convening industry, environmental groups, and other stakeholders to find feasible ways to further reduce emissions, and will serve as a key leader moving forward. Accepting on behalf of Colorado - Dr. Larry Wolk, Executive Director and Chief Medical Officer of the Colorado Department of Public Health and Environment. Since joining the Colorado Department of Public Health and Environment in September 2013, Wolk’s mission has been to simplify the health system for the citizens of Colorado and to position the department as the leader in providing evidence-based health and environmental information. During his tenure he has overseen flood recovery, a federal shutdown and the promulgation of the nation’s first air quality rules specific to methane reduction for oil and gas operations. His new frontier is addressing the myriad issues surrounding medical and retail marijuana.Before coming to the department, Wolk served as chief executive officer of CORHIO, Colorado’s nonprofit health information exchange. He was an executive with Correctional Healthcare Companies, Blue Cross/Blue Shield of Colorado, Prudential Healthcare of Colorado and CIGNA Healthcare. In 1996, Wolk founded the Rocky Mountain Youth Clinics, one of Colorado’s largest safety-net clinics and a national model for providing care to the uninsured. He continues to practice medicine there. In 2017, California — the fourth-highest petroleum-producing state in the US — put in place standards that will significantly cut methane emissions from new and legacy sites in the state. These standards create an ambitious example for other jurisdictions as they move forward to cost-effectively reduce methane emissions by requiring industry to use feasible, proven technologies that keep more natural gas in the system. In addition to the strong regulations, California has taken aggressive steps to reduce methane emissions from natural gas distribution and storage systems. Under first of their kind standards, gas utilities are now required to develop and implement plans to control gas leaks and venting. These rules are designed to reduce the climate impact of those emissions, so they move well beyond rules based solely on public safety concerns. By using new technology and business practices to find, fix and prevent leakage and intentional venting, utilities are expected to achieve a 40-45 per cent reduction in emissions while also making their systems safer and more resilient. Similarly, at gas storage fields, new requirements will allow faster detection of gas releases and higher confidence in system safety. Ryan is the Science and Technology Policy Advisor to the Chair at the California Air Resources Board (CARB). He is a leader in shaping California’s efforts to further reduce greenhouse gas emissions, promote zero emission vehicles, and reduce emissions of methane and other short-lived climate pollutants. Prior to his appointment at CARB by Governor Jerry Brown in 2011, McCarthy was a Science and Technology Policy Fellow in the office of California Assembly Member Wilmer Amina Carter. Ryan received his master’s and doctorate degrees in civil and environmental engineering from UC Davis and bachelor’s degree in structural engineering from UC San Diego. Oil and gas facilities have innumerable components that require regular inspection. Historically, testing each individual connection and fitting took significant time. FLIR Systems disrupted the status quo and has driven innovation in the tools used to quickly, accurately and cost-effectively scan for methane leaks. FLIR’s GFx320 and GF320 allow field personnel to visualize and geotag fugitive methane emissions in a manner that is compliant with the US EPA’s OOOOA methane rule. Through its infrared camera solutions, FLIR has enabled oil and gas industry clients all over the world to survey oil and gas facilities up to nine times faster than with traditional methods. In doing so, FLIR’s technology has not only helped protect the environment, it has driven continuous improvement in methane leak detection innovation. Accepting the Award on Behalf of FLIR: Craig O’Neill, Business Development Manager of the Premium Business Segment at FLIR Systems, Inc.
Craig O’Neill is a Business Develop Manager for the Instruments Division of FLIR Systems, Inc. with responsibility for the Optical Gas Imaging line of business. In this role he is the linking piece between customers, industry stakeholders and many vertically integrated aspects of the FLIR Instruments division including sales, marketing and product management. After graduating from Texas A&M University with a B.S. degree in Industrial Distribution, Craig worked in multiple industries as a sales and business development manager. In 2002, he joined FLIR Systems as the Sr. District Sales Manager covering the South-Central US and Puerto Rico with responsibility of supporting FLIR’s Optical Gas Imaging line of business in the Central US during this tenure. He has been involved directly in the OGI market since the introduction of commercial Optical Gas Imagers in May of 2005.